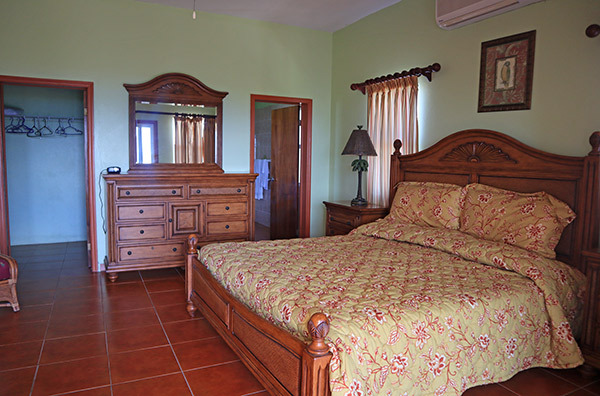 Recently I have been receiving many emails inquiring about long-term rentals in Anguilla. Surprisingly, these requests have been difficult to answer. 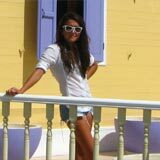 As it turns out, finding a picture-perfect Anguilla apartment for one year+ stay or longer is not easy. That all changed one afternoon while chatting with our neighbor and friend, Ambrose Fleming. 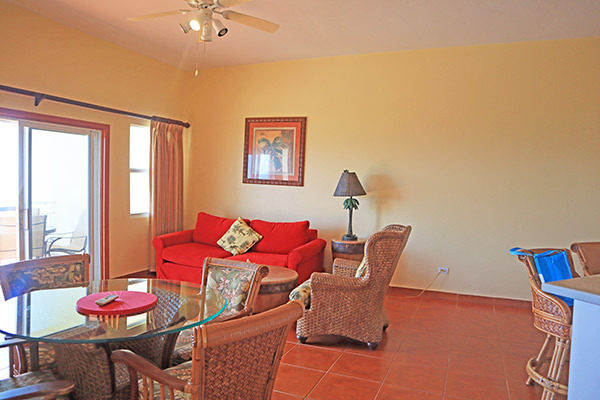 He is the man behind the bright and spacious condo complex, Ocean Terrace Condos set overlooking the Caribbean Sea. 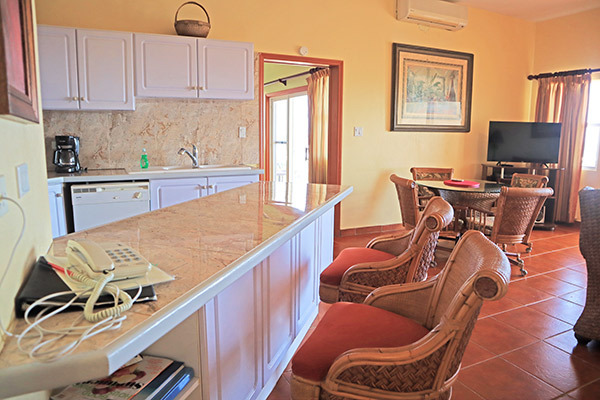 Welcome to "Your Home Away From Home"
Our family has long known Ocean Terrace Condos as an excellent "hotel alternative" for shorter stays in Anguilla. 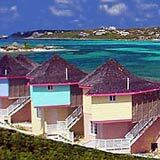 We stayed at Ocean Terrace Condos many times while my Dad was still building our home in Anguilla. Well appointed apartment-style units with tremendous views, Ocean Terrace Condos runs around $400/night in-season for short stays (one to two weeks). So, you can imagine my surprise when Ambrose told me his long-term rental rate (one year+ rentals). $3,000/month (everything included). "These condos at that price?" I thought to myself, "Now that is super high-value." 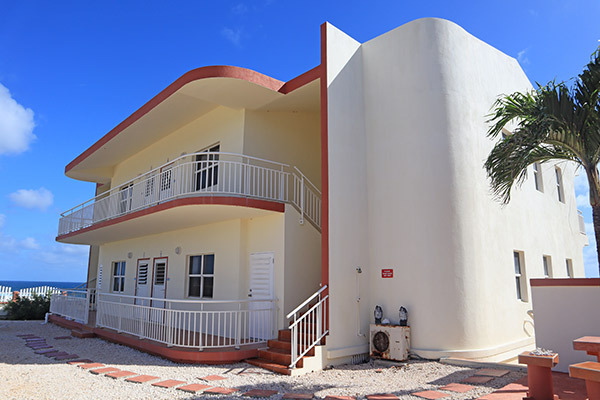 Ocean Terrace Condos is made up of two three-floor buildings. These buildings house Ocean Terrace Condo's one and two bedroom apartment-style condos. Each condo lays out more or less the same, with the two bedroom units boasting greater size and more natural light. Each unit opens into a corridor that leads into the condo's spacious living, dining and kitchen area. 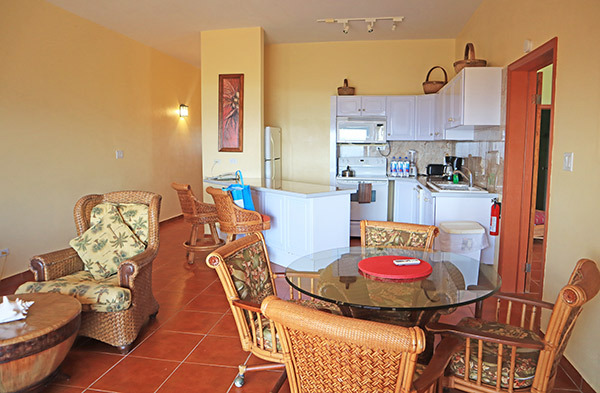 The kitchen is fully equipped with coffee maker, toaster, microwave and full-size appliances of dishwasher, fridge, oven and stove. It is fully stocked with plates, cups, cutlery and everything else you need to prepare meals in. It even boasts plenty of counter space. Its separate counter island with high-top seating is perfect for entertaining. A full-sized dining table is set just next to the kitchen. It faces the living area, which is complete with sizable flatscreen TV. Natural light pours into the living area via the living room's private balcony. The room opens onto a balcony with outdoor dining table and four dining chairs. 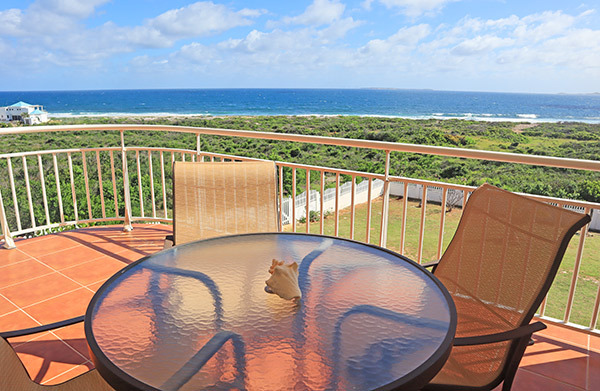 The views form Ocean Terrace Condos are especially breathtaking. 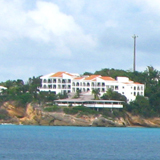 Ocean Terrace is built up on a bluff. 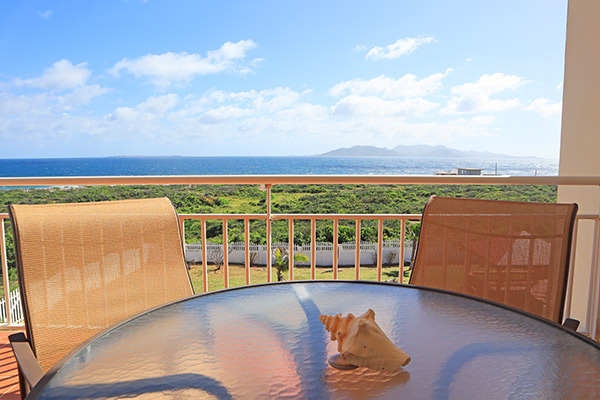 Its extra elevation provides sweeping vast views of St. Martin, the Caribbean Sea and St. Barths on a clear day. Back inside, the living room joins onto the master suite, which is complete with a separate private terrace with those same sweeping views. 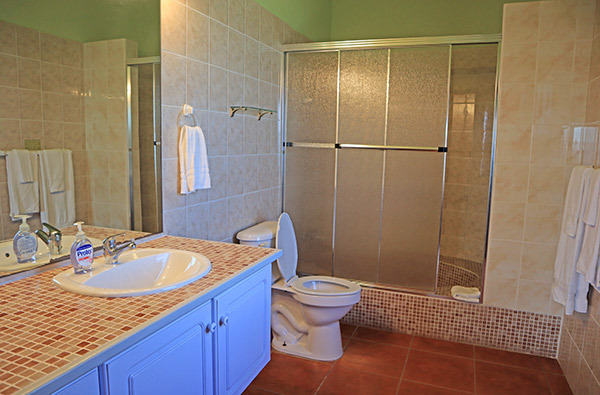 The bathroom features walk-in shower with circular sink tub. Clean and large, it is complete with a walk-in shower. The bathroom also has two doors. One opens into the main hallway and one opens into the second bedroom. This is a particularly smart touch. 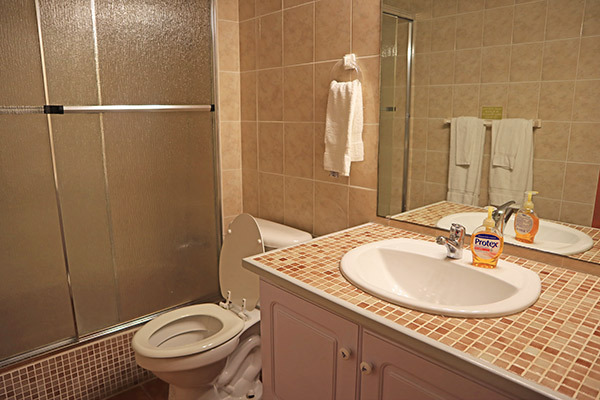 If you are traveling as a family, the second bathroom can function as a "main bathroom" just off of the living area. Or, if you are renting Ocean Terrace with a roommate, this bathroom can be locked off so it is only used by the person in the second bedroom. Clean, bright and spacious, the space is simply outstanding value. Two balconies, two bedrooms, two bathrooms, large kitchen, living and dining area... it doesn't end there. 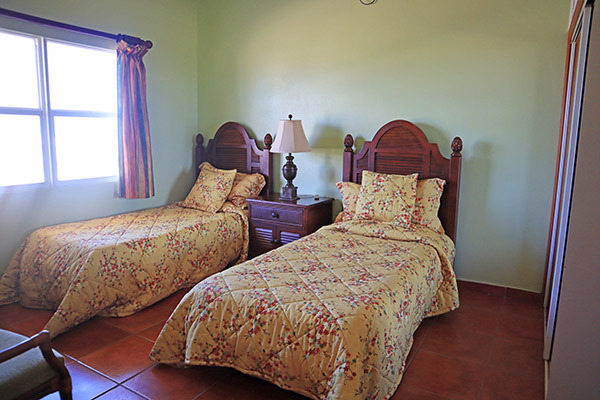 Both bedrooms and the living area are air conditioned. Fast WiFi flows throughout. Did I mention that twice/week housekeeping is also included? Beyond your unit, there are plenty of "extra-special perks." Ocean Terrace boasts a grassy lawn with BBQ (perfect for hosting events), private gym with cardio equipment, on-site parking and even a pool. Last but certainly not least, your "landlords," Paula and Ambrose who own Ocean Terrace Condos. They have been our neighbors for over a decade, and are the most reliable souls. There is something so reassuring knowing they are just next-door, only a call away. When it comes to long-term rentals, there is nothing that comes close to the value Ambrose and Paula offer at Ocean Terrace Condos. 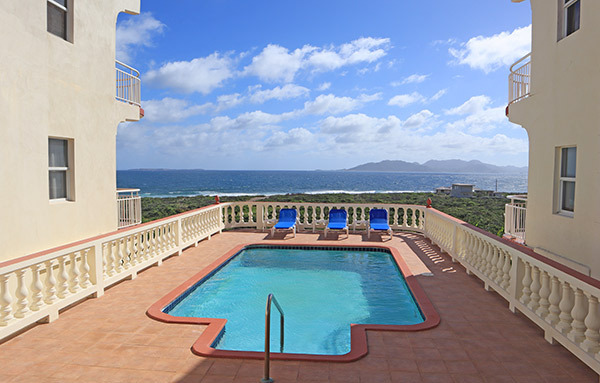 There isn't a better deal to be found when it comes to long-term rentals in Anguilla. Location: Long Path, Anguilla. See map below for exact location.